History, development, service and dive-bombing tactics, specifications, pictures and 3D model (Part I). Snow camouflaged Junkers Ju 87 B dive bomber taxiing in after a mission over the eastern front in winter 1941-1942. Ever since the end of World War One, the secret German Defense and Aerospace Ministry had shown a lively interest in a dive-bomber. In 1934 this led to a completely new design by Dipl-Ing Hermann Pohlmann, the head designer who had been with Junkers since 1923. The prototype Ju 87V1 flew in the spring of 1935 with a 640 hp Rolls-Royce Kestrel engine and twin-tail fins. While the smaller biplane Hs 123 won the emergency program for dive-bombers as a gauntlet, it was the Ju 87, which won the competition for a heavy dive-bomber of the Luftwaffe. 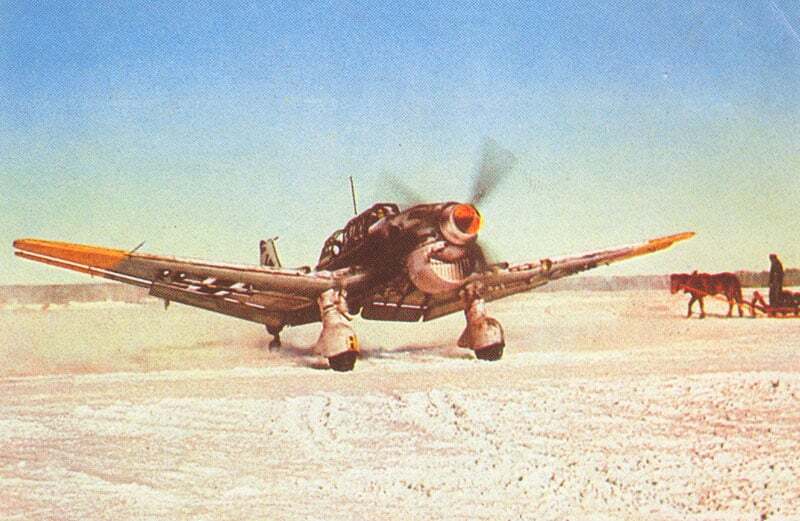 Subsequent prototypes and the first Ju 87A series aircraft no longer had twin twins and used Junkers Jumo 210 engines with a power of 610 to 680 hp. Structurally a resilient and modern designed machine, the Ju 87A had excellent flight qualities and was so easy to fly that the pilots initially tended to over control the plane. About 200 Ju 87A were built from 1937 to 1938 and a handful of them went to Spain to the Legion Condor. There the Ju 87 began to win their fearful reputation. Their disproportionate successes were out of proportion to the small number of machines which were used there, and they were particularly successful in the destruction of important bridges on the supply routes, port facilities and ships. The large republican supply bases in Barcelona, Valencia and Tarragona were all attacked with heavy losses of ships. Other air forces, with the exception of the Japanese and the Americans, seemed to have overlooked the lessons that a single Stuka with a single heavy bomb had a good chance of success, causing serious damage, or even sinking any ship class. Vics of Ju 87 dive bombers. The deafening scream of the diving aircraft belonged to the most terrible experiences of the population in the war zone. The Ju 87A was always regarded as under-powered, which confirmed itself in Spain. That’s why in 1938 the Junkers Ju 87B appeared with the far superior 1,100-hp Jumo 221Da engine, which enabled the aircraft to carry a 500 kg (1,100lb) and four 50 kg (110lb) bombs. The changes to the Ju 87B also included a redesigned fuselage, sliding roof over the cockpit and splayed wheels, while the armament of two 7.92mm MGs installed in the wings and a 7.92mm MG15 mounted in the rear cockpit remained unchanged. For this purpose, the aircraft became an automatic interception system to ensure a safe pull-up after the dive, and angle markings of 60°, 75° and 80° on the side of the pilot window. The experience in Spain had shown that the pilots could become unconscious during the upswing and lose control of the aircraft. The Ju 87B became the main production variant and was built for almost two years. The Ju 87B-2 variant flew for the first time at the end of 1939 and was able to carry a 1,000 kg (2,200lb) SC1000 bomb, but only when the pilot was alone in the aircraft. From the Ju 87B the Ju 87C and the Ju 87R were derived. The Ju 87C was a carrier-based version for the never finished aircraft carrier Graf Zepplein. The few built Ju 87C were then finally used by land-based units and the aircraft still under construction finished as B-2s. This Ju 87R is seen in Norway in April 1940. Then a new model, it carried extra fuel plus underwing tanks and was a ship destroyer. The Ju 87R was the long-range version of the B-2 and had additional wing stations for extra drop tanks and auxiliary tanks in the outer wings. It was first delivered in April 1940. At the beginning of the Polish campaign on September 2, the German Luftwaffe had 9 Stuka groups, which were equipped with 351 Ju 87B, of which 303 were operational. These Stuka groups inflicted enormous damage on the enemy ground forces and fleets during the campaigns in Poland, Norway and France, but versus harder opponents like the Supermarine Spitfire and Hawker Hurricane during the Battle of Britain their losses rises promptly. Regardless of this, Ju 87 B manufacturing carried on into 1941, together with large amounts for the Hungarian, Bulgarian, Romanian, and Italian air forces; as well as Ju 87 B carried on to operate successfully in Luftwaffe operations in the Mediterranean, the Balkans, Battle of Crete, North Africa and Operation Barbarossa, where Germany continue to held a degree of air superiority. 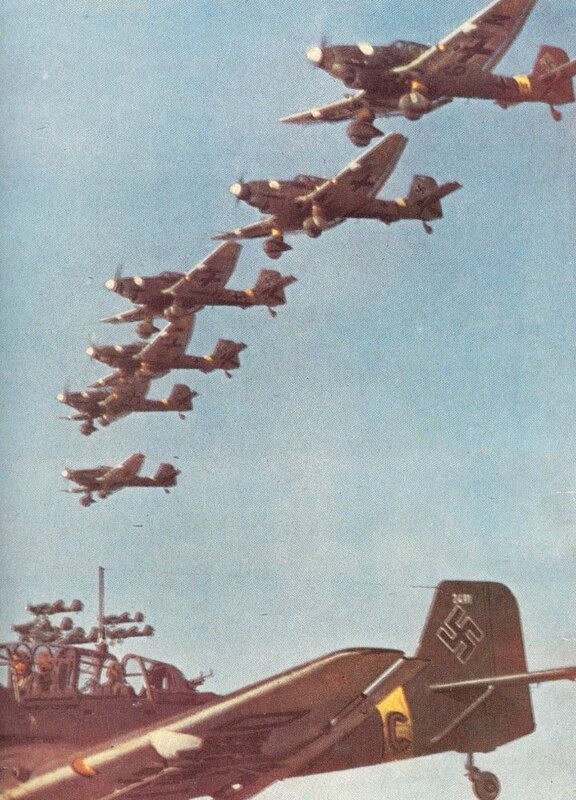 On June 21, 1941, 315 Stukas were ready for the support of Operation Barbarossa, of which 219 were ready for action. These were distributed over StG 77 (3 Stuka groups with 115 Ju 87B) in the II Fliegerkorps (Air Corps), StG 1 and 2 (4 Stuka groups with 158 Ju 87) in the VIII Fliegerkorp and IV(St)/LG 1 (1 Stuka group with 42 Ju 87) at the Luftwaffe Command Kirkenes in Norway. If one considers the many Russian reports on ‘relentless German dive-bombers’ attacks in the early stages of Operation Barbarossa, the number of only 315 available Stukas is surprisingly low. Even if every Ju 87 could have been flying four or five times a day, which is quite unlikely, and each aircraft would always have been ready, it would have only 1,500 Stuka missions a day on an almost 1,500 miles long and several hundred miles deep operational area respectively. In reality, the number of Stuka groups was so small that the Luftflotte (air fleet) 4, which had to support the entire Southern Army Group and the entire Romanian army on the Black Sea, had no unit with Stukas at all. The fact that so few Stukas apparently developed such a dreaded reputation among the Red Army, which is completely disproportionate to the number of deployments, gives an idea of the effectiveness of the Stuka dive attacks and ground attacks. Junkers Ju 87 D Stukas of I./StG5 on their way to a target near Leningrad early in 1943. Each aircraft carries three AB250 small bomb containers, eaach holding 108 SD-2 anti-personnel bombs or 17 SD-10 anti-armour bomblets. The availability of the Jumo 211J-1 engine has led to the development of the Ju 87D series, with the Ju 87D-1 coming into production in May 1941. The Ju 87D-1 could carry a heavier bomb load of up to 1,800 kg (3,965lb) and had a twin 7.92mm MG81Z mounted in the rear cockpit. The D-Series was also aerodynamically improved by having a ‘tidy’ nose and hood design, allowing the engine coolers to be placed under the wings and wider propeller blades could be used. In addition, armour protection for the crew and fuel tanks was significantly improved. The D-series was the most-built version of the Stuka and the sub-variants included the D-2 as a glider tug, D-3 for ground attack with additional armored protection, D-4 as a torpedo bomber, D-5 with an ejectable landing gear without dive brakes and D-7 for night ground attacks and two 20mm MG151 guns in the wings and D-8, which was a D-7 without the night-flying equipment. Although the D-series was mainly used after 1941, considerable numbers of it appeared at the end of 1941 with the Stuka groups on the Eastern front. The last combat version of the Stuka was the Ju 87G-1 tank buster, which was basically a rebuilt D-5 without dive brakes. The aircraft was equipped with two 37-mm BK 3.7 Flak 18 guns under the wings. This was a special armored combat aircraft, which was put into service around the turn of the year 1942-43 and even successfully used by experienced pilots until the end of the war on the Russian front. The Ju 87 G combat debut was 1943 and in action it was successfully against Russian T-34 tanks with the two 37-mm BK cannon under the wings, until the Russian air superiority by new fighters like the Yak-9 or La-7 during the second half of the year 1944 became too strong. The Ju 87H appeared as last version with double control, which was also converted from various D variants. Originally, no training aircraft was found to be necessary for the Stuka, but from 1943 the increasing enemy air superiority required special combat techniques for this sensitive and slow aircraft, which new pilots had to be learned by experienced Stuka pilots before their first front line missions. Manufacturing closed in September 1944, when in excess of 5,700 Ju 87s (all versions) had been produced. Users: Bulgaria, Croatia, Germany, Hungary, Italy, Romania, Slovakia. Tagged 1939, dive bomber, germany, junkers, luftwaffe, stuka.